Dave showed up late one night at the studio, listened to "View From a Bridge" once, then recorded it live in one take with Karen playing guitar and singing. Dave is a versatile "project player" in several New Orleans bands including Ricky Castrillo and Dreamland, Three Now Three, and the drummer Brian Blade. 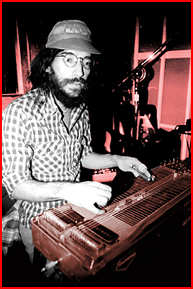 He was voted "Best Pedal Steel" player in Offbeat's Best of the Beat Music Awards in 1997.